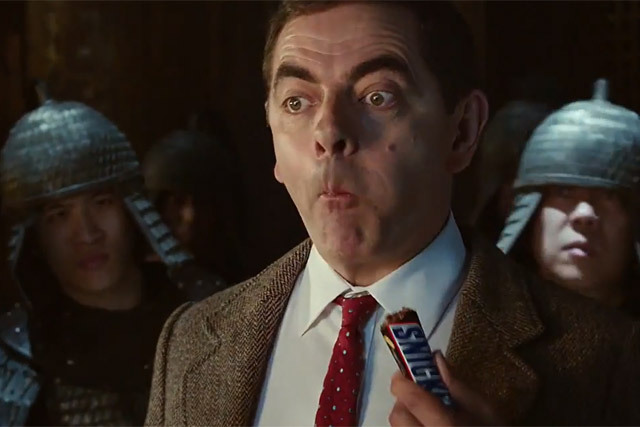 Mars Chocolate UK has unveiled a Snickers ad featuring the Rowan Atkinson character Mr Bean as a martial arts master. he ad, created by AMV BBDO, was made in Mandarin with English subtitles and filmed in a style reminiscent of martial arts epics such as 'Crouching Tiger, Hidden Dragon', which opens with a similar rooftop scene. Atkinson, in his first ad since the 1990s, stars as a Kung Fu master who is not feeling his usual self until he eats a Snickers bar. The 60-second ad is the latest execution in the brand’s "you’re not you when you’re hungry" positioning. Previous ads include the Joan Collins "diva" ad, which showed the star in a locker room. Executive creative direction was by Adrian Rossi and Alex Grieve with art direction by Andy Clough and copywriting by Richard McGrann. Daniel Kleinman directed the film through Rattling Stick. Other activity includes four Mr Bean Kung Fu training sketches on Snickers’ social channels and a Snickers takeover of 'The X Factor' app. A 60-second film will also be shown in cinemas across the UK. Michael Magee, the vice-president of marketing at Mars Chocolate UK, said: "Mr Bean is such an iconic and internationally recognisable character, who fits so well with the Snickers brand, giving this ad great global potential." The ad debuted during 'The X Factor' on 4 October.